I’ve never been a fan of oatmeal. It always reminded me of a big glob of mush and grossed me out. John, on the other hand, could eat it night and day. In an attempt to eat a healthier breakfast I set out to explore steel cut oats and have been pleasantly surprised every morning! I’ve tried a few different ways of preparing steel cut oats and the KEY is to not over-cook it or there we go and end up with the bowl of mush. When done correctly it’s got a nice little something for your teeth in each bite. 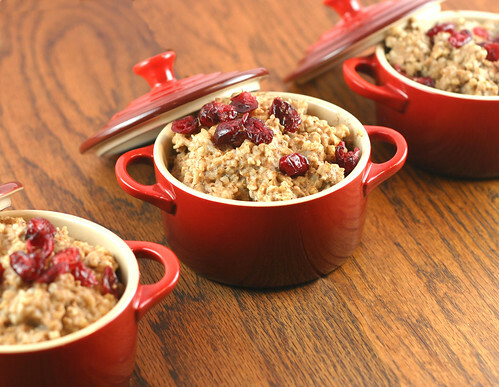 Steel cut oats are not a quick morning breakfast to fix UNLESS you make up a big batch when you have time and reheat your serving in the microwave each day. I usually make one batch a week and store it in Ziploc containers and measure 1/2 to 3/4 cup out into bowls in the morning. Leave the lid on and let it sit and absorb the rest of the water for 45minutes to an hour. Cool and store in containers in the fridge. Who else but Mary could make plain old oatmeal look good? John surprised me with those pots – he sure is a gem. The presentation is so pretty. I love steel cut oats, and I add flax seed on mine as well. wonderful,i like oats and those red bowls are very pretty! Great pictures you have there, very well done! Oats are not a common thing in Lebanon and I never had any, but you do make them look appealing. Very pretty. I also like to top oats with a mixture of pumpkin seeds, sunflower seeds and flax seeds. We love oatmeal around here, making a big batch once a week would be great and easier on me in the morning, Thanks!! Are those like mini-Le Creuset bowls? How freaking cool! I love steel cut oats, and this sounds delicious. Yum! I agree with the masses: am lovin those bowls! Yep the bowls are sweet and the photo even suuweeeter! Never tried the steel cut oats and don’t think I’d handle the texture too well. I do like oatmeal very much. There isn’t too many foods that would gross me out, except maybe bugs. Wow! You’ve managed to make oatmeal look so beautiful and cute! The bowls, composition, presentation, and photography are excellent! For topping, allow me to insist on having something redish, just to match with the lovely bowls : ). PS – just read your recipe – love the idea of being able to make a week’s worth in advance! I love the presentation of these. It makes oats seem so exciting. 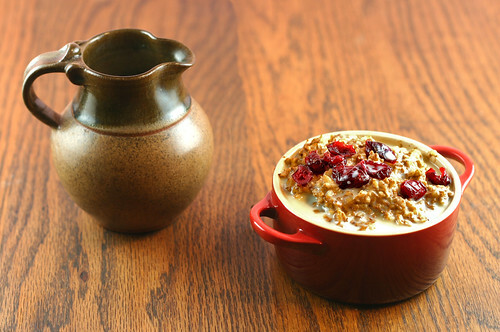 Please, oatmeal lovers, hear my plead to make ur oatmeal (and try this recipe) using milk! Non fat, 1% and 2% all work wonderfully. It upsets me to see people using water in oatmeal, it results in a more slope like consistency with much less flavor and also less nutrition! So, I am asking you to please try with milk, your world will be changed. Thanks for the recipe, yes oatmeal needs jazzed up I think. 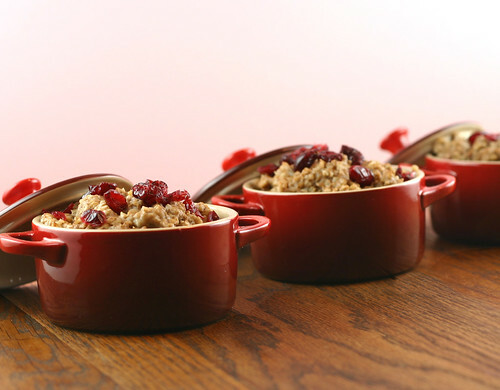 We love steel cut oats at our house and agree that making up a batch to re-heat is the way to go. The pumpkin pie spice sounds like a nice twist. I make them in my slow cooker too. They’re ready first thing in the morning for us. First of all, I just adore those cute little red pots you put the oatmeal in. I am hosting an oatmeal roundup over at Our Krazy Kitchen and would love for you to link up this recipe. Nice! What day should I come for breakfast? I’m like you with the mushy bland oatmeal thing and I just bought some steel-cut oats to try for just that reason. Thanks for the recipe! My own prefrence, instead of whey protein. I do 1 1/2 cups of steel cut oats & 1/2 cup of quinoa, the quinoa adds a whole lot of protein and some more crunch.